For a long time I have been fascinated by walking robots, especially the awesome creations from Boston Dynamics. Their 26km/h wildcat made the headlines last year. But quadruped robots like that are something you can’t build by yourself. They require a huge amount of money and programming skills. Or do they? Most four legged robots that you can find on the internet use a spider-like leg configuration, where the legs are symmetrical to the center of the robot. 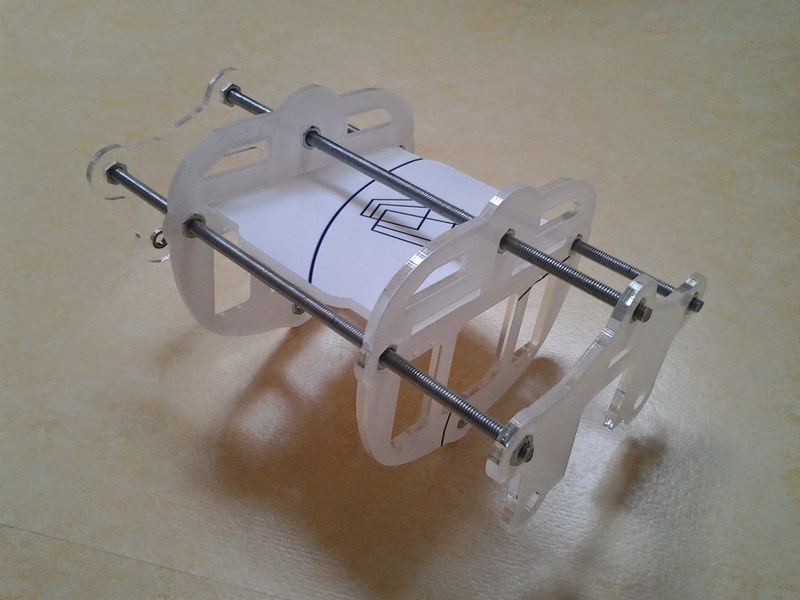 Although this would be more stable and easier to program, I decided to build a mammal-inspired robot. Mostly because I wanted a challenge and it leaves more space for a proper design. I paid around 40$ for them in total. Despite the price, the quality is pretty good. They don’t have much trouble lifting the robots weight. As a servo controller I wanted to use a Pololu Maestro at first, but had some problems with it. It did not accept the power supply I was using, which led to servo jittering and uncontrollable movement. Now I am using an Arduino MEGA, it has enough pins to control all twelve servos on its own. The Arduino is powered over USB by a Laptop or for untethered testing by a 5V 1A power bank. Because the robots will not be autonomous for the time being, it needs a remote of some sort. I decided to write an Android app and plug a Bluetooth module into the Arduino. In a later update I added an ultrasonic distance sensor to the robots head, which can be rotated using a small servo. This way, the robot can scan the environment and could detect if it will run into a wall. 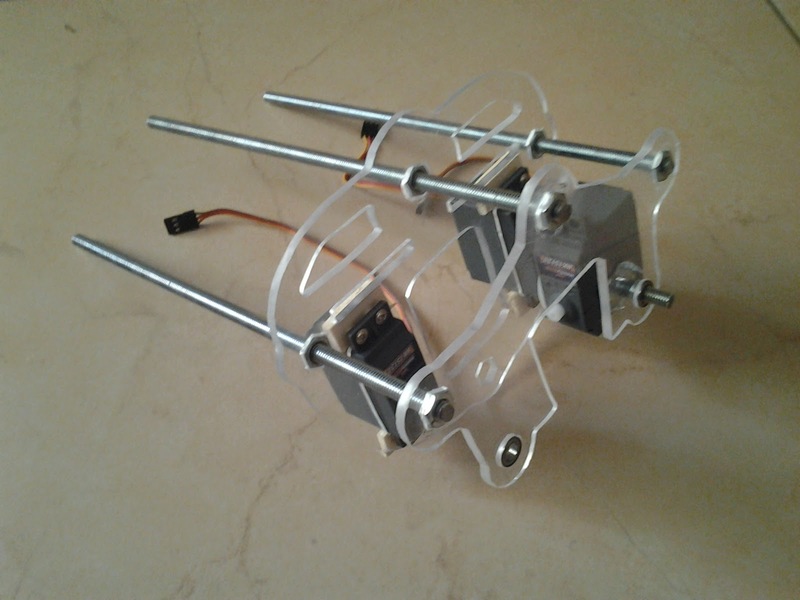 To connect servos and electronics some kind of chassis is needed. At first I thought about 3d-printing one, but that would break the budget as I don’t have my own printer and would have to order all the parts. That meant I needed a 2D-like design. Wood as a material does not look professional enough and aluminum is too heavy, so I went with acrylic glass. 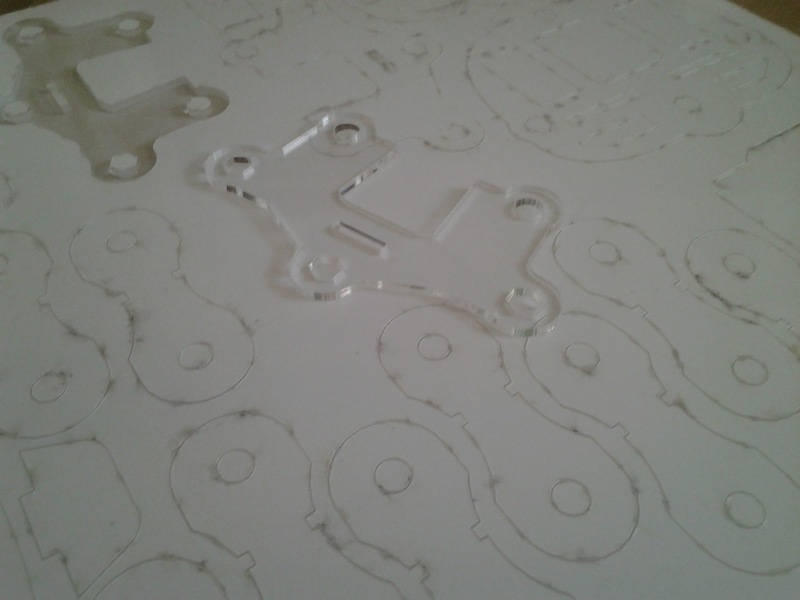 Four acrylic plates (5mm) form the robot's body. They are connected by nuts on threaded rods, which are covered in aluminum tubes. The inner plates are rounded and have foam on the sides to protect the robot when falling over. The outer plates hold the counter bearings, which are made of a t-nut, a piece of threaded rod and a small ball bearing. Another horizontal plate serves as a mount for both the Arduino and the battery. Upper and lower legs are connected by acrylic parts, also using ball bearings for the joints. On the lower legs I had to improvise: They are made of cheap camera tripod legs, secured with cable ties. The rubber ends ensure good grip. Every robot needs a head, so I added that later. The ultrasonic sensor serves as the robots eyes. Everything from the first sketches to the final design was done in Sketchup. At first I made some prototype parts using a fretsaw, which took me hours. Later I decided to order the parts online and came across Formulor, which offers cheap laser cut parts and quick shipping. The precision is impressive, even the edgy curves caused by Sketchup are visible. I somehow underestimated the stability of 5mm acrylic glass, 3mm should be enough in order to save weight. The unpowered robot would fall over immediately, so I made a simple stand for it using a three-legged stool. Two strings on the front and back of the robot can be attached to a plastic rod on top of it. The Arduino sketch is divided into multiple files (tabs): Main, IK, Gait, Serial and Servo. The main file calls the other functions and initializes most of the variables. To move the robots feet you need to calculate the inverse kinematics for each leg. It is basically an equation where you input coordinates and get servo angles as a result. You can either use simple school math or search the internet for solutions. Trying the calculation in Excel before flashing it to an Arduino can save a lot of time. 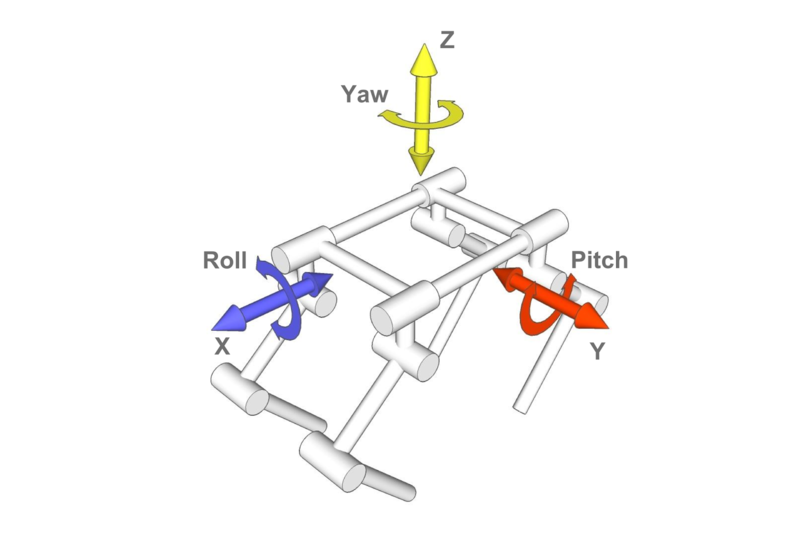 After this is implemented, the robot can move it's body precisely along the XYZ-coordinates. To rotate the robot you need a rotation matrix. This is another system of equations where you input a coordinate and values for roll, pitch and yaw and get the rotated coordinate as the output. 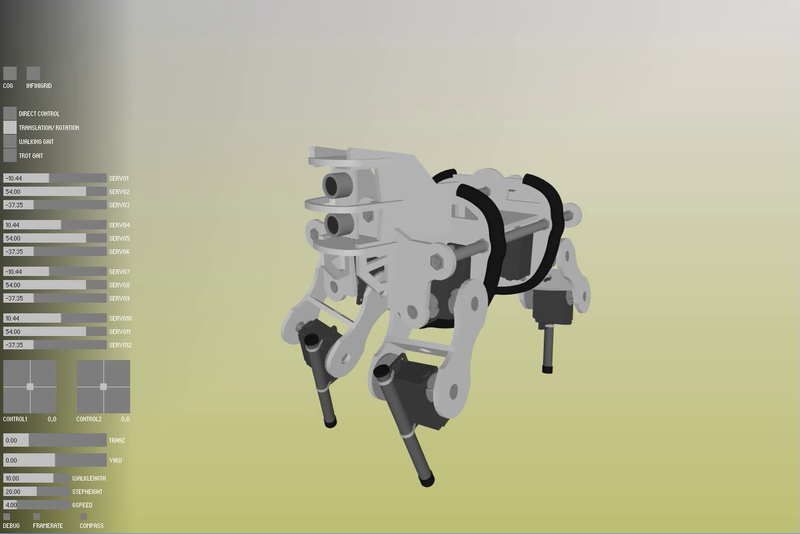 I found this blog post by Oscar Liang really helpful: http://blog.oscarliang.net/inverse-kinematics-implementation-hexapod-robots/. The serial tab manages the incoming data from the Bluetooth module and the ultrasonic sensor. This works the same way as receiving chars in the serial monitor of the Arduino IDE. Servos are controlled directly using the servo library. The entire program works like this: At first the Bluetooth function gets called to look for new input. Then the right gait function is selected. It calculates the coordinates for every leg. After that the rotation and translation is calculated. To get the right servo angles the coordinates have to be converted from “full body” to “single leg”, then the inverse kinematics function can work its magic. Finally the servos are moved to the calculated angle. Gaits are probably the most complicated thing about legged robots. Because I wanted quick results I made a simple walking gait based on sine functions. 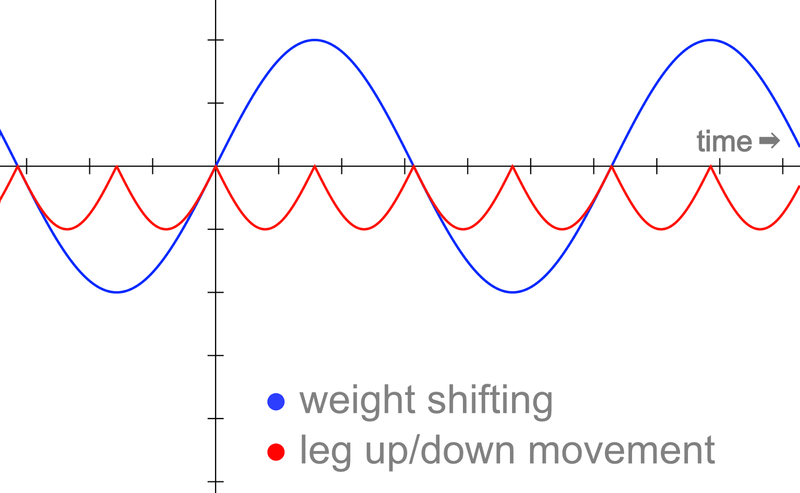 As you can see in the diagram each leg is lifted after the other using a function (red) like -|sin(x)|. When one leg is in the air, the robot will tend to fall over. Therefor a second function (blue) moves the body away from the lifted leg. The advantage of this gait is that you have fluid movements. But the robot can only move in one direction. I tried to program a trot-gait later, but the rapid leg movement is too much for the servos and the frame. Figuring out the gaits is a tedious task. Even the smallest change to the code requires you to flash the Arduino, plug the battery back in and lift the robot out of it's stand. If you make a mistake, the robot will fall over or the servos will move in the wrong direction, eventually destroying themselves or other mechanical parts. After this happened to me a few times I began to search for an easier way of testing. There are some robotics simulators (e.g. Gazebo, v-rep) but I found them too complicated, importing the robot’s geometry alone took me forever. I ended up writing my own simulator. Processing is the perfect choice for this. It has libraries for graphical user interfaces and can import and render different cad files. The best thing is that you can practically drag and drop Arduino code into Processing (This is because Arduino code was originally based on Processing). There are a few minor differences, for example arrays are initialized differently. But if you can avoid that you can simulate the exact behavior of the robot and copy the working code back to the Arduino. Compiling the Processing sketch only takes around 5 seconds. The final simulator version can display the robot in color, has a user interface with buttons and sliders, there are different modes for manual servo control and moving the robot around different axis (I even found a bug in my IK code this way). The only difference is an additional sonar to display the values of the ultrasonic sensor. Considering the low budget I am pretty happy with the robot so far. The stability and servo power is acceptable. I am already working on more advanced gaits, but even with the simulator this is a time consuming process. Dude this is really nice, you could sell kits for those or perhaps start your own kickstarter project in the future. This is so badass man you have to kickstarter it, or at least release a way more detailed guide! I also used Orcar Liang studies according to spiderbots design. I like boston dynamics style. Your bot is really amazing and sharing this project is very helpfull for bot designers. Sharing arduino stuff (even privately and why not according to license agreement) should be a very valuable gift. Sharing arduino stuff should be a very valuable gift. Sorry, I still have not released the Arduino Code for this project. You did a really nice work. I'm working in something similar, so I'd be very thankful if you share again your Excel sheet for the inverse kinematics. interesting. It is the project that I was looking for. I liked the mechanics a lot .. I'm going to implement a multiwii code with some mofifications to stabilize your design. I hope to work with the changes that at this moment I am thinking in my head. thank you. Waao,this is such a amazing project. Will you please provide the Arduino sketch. ?